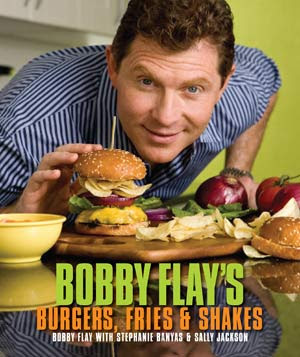 Every Sunday, I'll be featuring a burger recipe from Bobby Flay's newest book, Burgers, Fries & Shakes. It's my little tribute to burgers since it's the perfect time of year to get them on the grill! The first burger recipe to kickoff Burger Bunday is Bobby's Greek Burger. I tweaked the original recipe slightly by using pita bread instead of traditional hamburger buns. Although the recipe calls for 80/20 ground beef, I would think that the burger would work really well using ground lamb too. Overall, I really liked this recipe. I've had a craving for Greek flavors lately and this definitely satisfied those cravings! I have always loved Greek food, and a trip to Greece a few summers ago only reinforced that affection. The Greeks are doing something right with their Mediterranean diet rich in olive oil. A burger might not exactly fit into those parameters, but I can use the salty, briny, and fresh elements that they love to make this burger Greek. Flavorful kalamata olives are blended into a spread for the bun, and this combo wouldn't be Greek without some salty feta cheese and ripe tomato. You might not be as familiar with tzatziki, but this tangy blend of thick yogurt, pungent garlic, and grated fresh cucumber is a staple in Greek cuisine and is used for practically everything, from a dip for wedges of pita bread and French fries to a topping for sandwiches. Whisk together the yogurt, cucumber, and garlic in a small bowl and season with salt and pepper. Refrigerate for at least 30 minutes or up to 8 hours before serving to allow the flavors to meld. Combine the olives, oregano, and olive oil in a food processor and process until smooth. The olive paste can be made up to 1 day ahead, covered, and refrigerated. Bring to room temperature before using. Place the burgers inside each pita pocket, and spoon some of the yogurt sauce and olive paste over the burgers. Top with chopped tomato and more feta, if desired; and serve immediately. i am dying for one of those greek burgers now. great shot. What a cool idea, burgers are the best in the summer! Your Greek ones look great with that feta - yum! Mmm it's like a gyro burger! How delicious! I just showed this to my husband and he's like wow! I agree, WOWZA, looks delish! Mmm looks like a delicious burger! It would be great with ground lamb too! YUM! I love greek flavors. This looks fabulous. I love this idea for these burger posts. You are inspiring me to break out my Bobby Flay books!